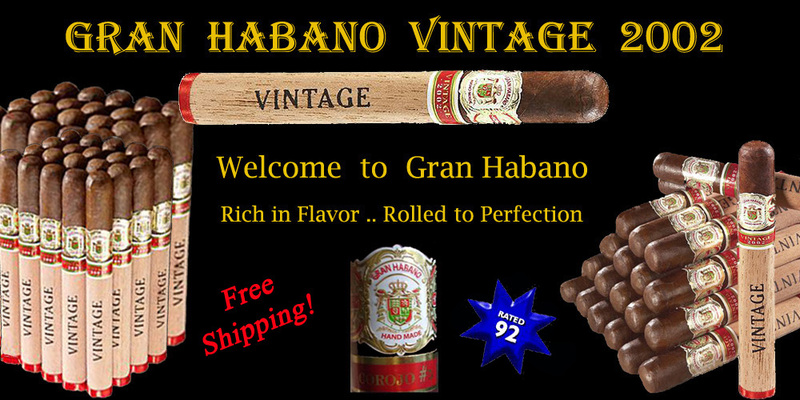 Gran Habano Vintage 2002, an aesthetically appealing premium cigar consisting of medium bodied, Habano-seed long-fillers from the Dominican Republic and Nicaragua. They’re wrapped in a thick, toothy Nicaraguan-grown Corojo wrapper leaf cultivated back in 2002 and one which has enjoyed an extended cedar nap for eight years. The result is a smoke loaded with a series of rich, creamy flavors that smack of coffee, nuts, and earth and are tamed by the smooth, Cubanesque qualities of the well-aged Corojo leaf. Expect a very easy draw and a fine long white ash, an indication of well aged tobaccos. The cigar is medium bodied and it maintains a wonderful balance and long, elegant finish. The Gran Habano brand means seriously well-made cigars jam-packed with tasty tobaccos. Their stogies always feel heavy in the hand and every Gran Habano cigar tastes exactly like the last. Known for consistency, the Gran Habano Vintage 2002 is sure to please both your taste palate as well as your wallet. Enjoy!